"Are you too hot to walk up the hill?" I huffed and puffed at my friend's neighborhood sale. I was thinking twice about it, myself. The owners' eyes gleamed when they saw my baby belly approach. "Are you looking for some nursery furniture? We'll take any offer!" That night, an angry Elise hoisted one leg over the crib rail and took a leap. Can't wait for the rest of the story! Haven't been yardsaling lately but you're making me want to. oh, poor Elise! ;) I couldn't help but giggle a bit at the "angry Elise" comment. Isn't it funny how things like transitioning to a big kid bed are so earth shattering to them now, but they get over it so quickly? Yeah! How beautiful - isn't it amazingly wonderful how God plans for our needs even before we know ourselves what we will require? I am so happy for you - I know you will make a very special room for your blessings with this lovely furniture! That's beautiful! Way to go Meredith! What a pretty set. I really like it. I am sure that Elise will love it too. What a pretty set! I'm dying to know what you paid for it. Can you spill the beans, pretty please? Why do they always figure that out when we least expect it?! I'm hoping to get Mo transferred to his toddler bed before he learns he can climb out of his crib. Meredith, you are a wonder! God always seems to have you in the right place, doesn't He? What a beautiful set and Henry Link too! I'm dying to know what you had to pay. I know, I know. I'm nosey, but I get such a vicarious thrill to see your great deals! That is gorgeous furniture. 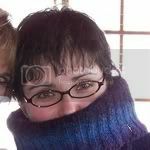 Ive always been parial to wicker. Divine Providence! :) It's lovely and great quality! Oh, I hope you got them! Beautiful pieces & I'm sure it was a bargain at the yardsale. I love that coral piece you picked up too! You did better than I did..I got one almost just like that for $2 (and was happy to pay it!). Your 25 cent bargain was great. I'm confused. Did you buy the white wicker for the new baby or is it "big girl" furniture for Elise? I can't tell from the picture whether it is a crib or headboard. Elise angry???? Noooooooo. That sweet little thing. :) That set is beautiful. Doesn't Elise's room have a garden kind of "theme?" I think it will be easy to work in a little green and maybe a few froggies :) for baby brother. Brenna and Christian share a room - it's very pale pink and blue, sort of a princess and the froggy prince kind of thing. The only real problem is that the double bed and crib are a tight fit. We decided to leave the double bed for now for visitors, but when we finish the downstairs we'll move it and get Brenna a twin...of course, Christian may move into the boy's room at some point. I guess we'll see. At any rate...the nursery set is beautiful! Your Elise sounds like my little Emily :) That set is lovely and I know you will have an amazing big girl room for her! My prince and princess shared rooms for 10 years. They then slept on each other's floors for another 3 or 4 years. God is good to provide a beautiful set of furnishings for your darling. May your youngers turn out to be as close as mine are ----at 22 and 24! Can't wait to see the room decorated with that great furniture! White wicker is what my daughter had - I love this picture. It reminds me of her. We paid $100 for the complete bed set plus dresser (including guest room mattress and toddler crib rail). It was a lot of money to me, but I rarely see daybeds that are so attractive and well made. We are going to put it in her bedroom this weekend. Love that! 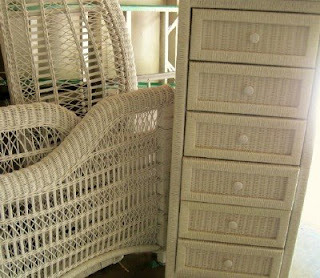 big fan of the beautiful white wicker bedroom furniture! i don't know that I would have been able to pass it up. Mine never jumped out, but somehow began to figure out how to climb in it when she was out. I figured if she could do this then it was only a matter of time really. we too are transitioning. Putting baby boy in what used to be out dining room. 2 kids in 2 beds/1 bath. Now we just eat in the kitchen.